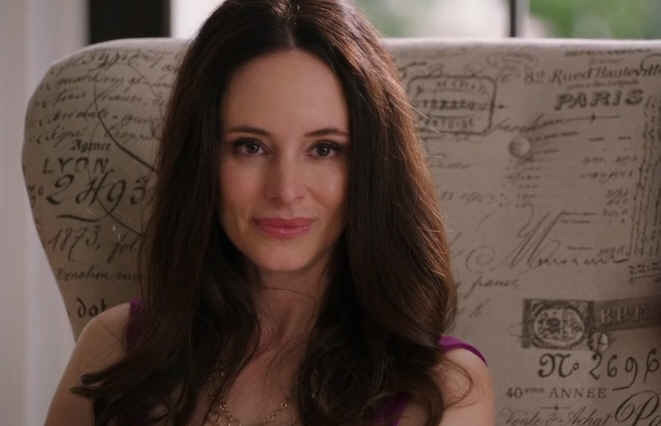 Ever since I posted photos of those fabulous Hamptons beach houses from the new TV drama “Revenge,” I’ve been getting emails about the chair in Victoria Grayson’s living room. Everyone wants to know where they can get one like it. Well, I had no idea. But then a couple of readers told me they found something similar at HomeGoods. It’s not as tall, and the shape of the chair itself isn’t as dramatic as Victoria’s, sadly, but hey. The price is right! I bet Victoria paid more than $300 for hers. So if you’re one of those readers who told me you were desperate to find one like it, run–don’t walk!–to HomeGoods and see if they have any left. You know how fast their inventory turns over! Kathy says, “Orig. $899; HG price $499.99; my clearance price $349.00!” Wow! She bought it before “Revenge” premiered. I imagine they’re a lot harder to come by now that Victoria made it famous! On a side note, I haven’t been happy with the photos my new iPhone takes. They’re all a little blurry as you can tell from these that I took of this chair. I was complaining about it to my husband Dave, who looked it over and said, “Well, it might work better if you took the plastic film off the back of the phone first.” D’oh! 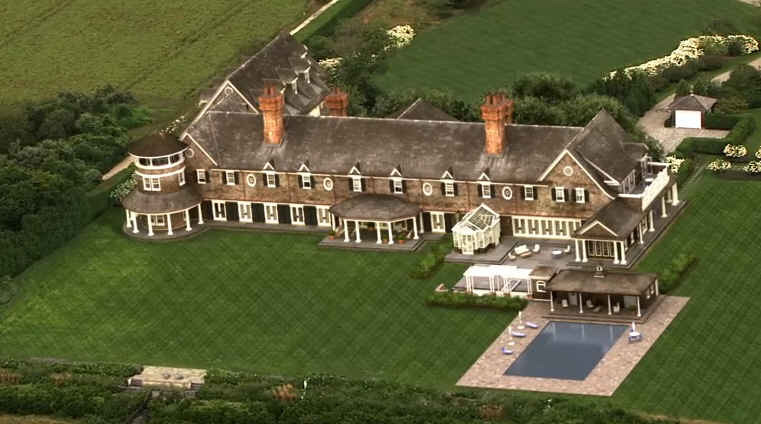 But Jim Wolfe tells me the house they based it on is “located on the corner of Further Lane and Cross Highway in Amagansett. They just stretched it, moved the pool and added a few extras.” Those of you who are familiar with that area will have to let us know if you’ve seen the one he means. Emily Thorne’s Beach House in Revenge, with a Behind-the-Scenes Video Tour. You can see more photos of the “Revenge” beach houses here. I believe that chair is available at Restoration Hardware. 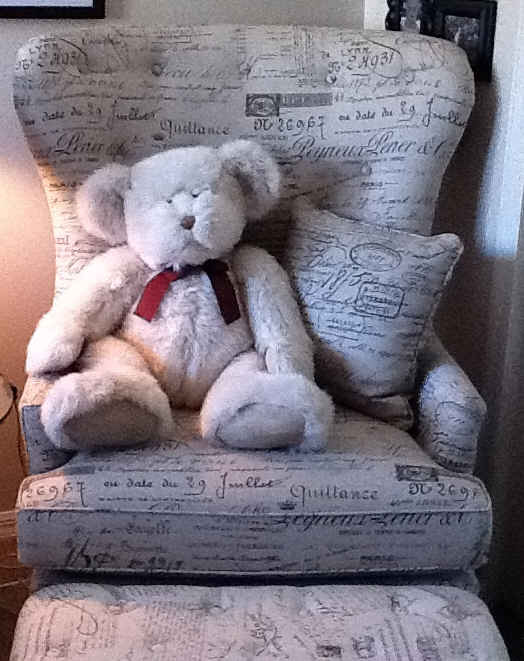 The fabric from the chair is available from Ballard Designs. It’s called Document. I searched Ballard for a matching chair but I didn’t see one that was a perfect match. I love the interiors on that show! And here’s the link to the Document fabric that looks like a perfect match! We can fabricate all of the furniture on the show or we can reupholster your existing furniture to match the furniture on the show. We deliver to NJ, NY & PA. I was wondering if you could custom make the cocktail table? I have a large sofa (89″) in my sun room and need a oversize table. Well, I can’t, but I’m sure there’s someone out there who could! Please send us your photo? oh I do love that chair, I can see why it caught your eye!! Lauren Liess, Pure Style Home, has a similar chair. love the chair, love the house and love your great job Giulia!thank you! It does look like it! Thanks! You can also get the chair from Ballard Designs. I’ve never seen this show…I’ve been out of the country, LOL!, but I would watch it just for the house and decor! Love that chair, the Homegoods version would be just the right size for my not too big house. I’m fighting the urge to go buy it! If one is a handy kind of person, they can DIY, there are lots of similar fabrics by the yard…. As a side note, if you think the chair looks fabulous in this fabric, think what a bed would look like! There is an antique shop nearby called Glory Days Antiques, where one of the sellers took an antique bed and upholstered it in the French Script fabric. It’s simply stunning and I always want to purchase it every time I go in there. But alas, I have no room for it. This is great! Thanks, Arie! LOVe the show..that chair and yes I think that is the same house in the listing!! I would love to live in it!! LOVE THAT SHOW! I just bought an ottoman over the weekend that looks very similar to the chair at Stein Mart. $99 baby!!! HomeGoods actually has one that looks even more similar than the one you found there. In fact, I think it is nearly identical! They have a few different styles of chairs in the French script…. Love that chair… thanks for the scoop…. but most of all love your humor and the anecdote ab leaving the film on the camera… sounds exactly like my life… still laughing. I’m gonna start calling you Nancy Drew! Too funny about the film on your iPhone. 😉 I looooooove Emily’s beach house. I love the style of the chair and the fabric. I fell in love with a canvas/burlap wrapped dresser with the same sort of style. And thanks for your previous post on this show. That caused me to watch the show and it is now my favourite show of the season. Thanks! That is not the chair! However I did buy the exact one (high modified wingback) at Homegoods in Tampa, Florida. Orig. $899; HG price $499.99; my clearance price $349.00! I ABSOLUTELY LOVE IT! No kidding? That’s great! Mine must have been sold out of the wingback version. Because of your previous post on the Revenge homes, I am now watching (and loving) the show. What a neat looking chair. The one you found and the ones your readers found look so similar. What great finds. Those houses do look like the ones they used for the show. Pretty cool. There was a movie on Hallmark last night 10/23 called Edge of Garden. There was the cutest cottage with beautiful gardens. Do you have any insight on this house? I saw that movie and loved the cottage! Have no information on it, though. Sorry. We know you will soon have the info on this cottage – Right ? I absolutely love, love this site. Every time I ramble through it there is something I find that makes me squeal !!! That chair is really gorgeous, both the Home Goods version and Victoria’s. Revenge is such a good show! Thanks for this post, Julia! What is it about that chair? Yes, the hubby and I are hooked on it -thanks to On Demand we watched the 4 episodes last weekend. Love it. Great show, finally not a another bloody crime show. Of course I love the houses and interiors too. Isn’t it funny how it can be a set or location which draws us in as much as the show? We have a beach house across Peconic Bay from the Hamptons, and while I don’t watch the TV show you mentioned, I was in the local (Riverhead, NY) HomeGoods this past weekend when we were at our shore house — and they had that chair, the wingback one with that fabric, for $499. I had no idea it was famous. Now that you mention it, it does look photoshopped. Especially the pool and cabana area, it doesn’t look real! Its always so disappointing to find out our favorite TV or Hollywood houses aren’t real. Its like seeing a super hero out of costume! This chair is differnt … a slipper chair rather than a wingback and the fabric is different but it might fit some folks’ spaces better and it’s much less expensive. 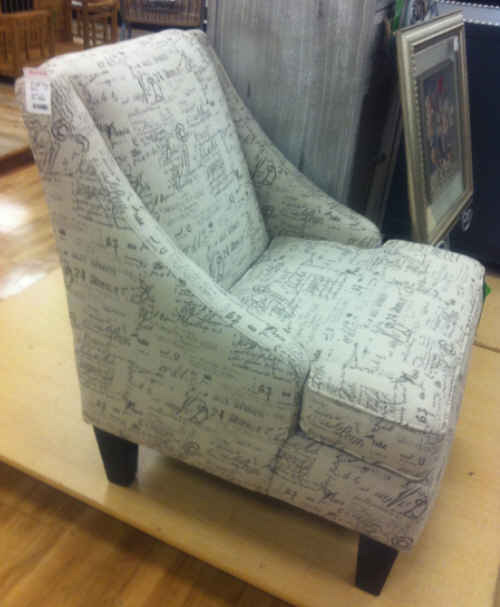 I don’t own this chair but it comes up whenever I search “accent chair” and I think it’s cute. Ooh, I like that one, too. Thanks, Colleen! Your chair looks awesome! I love it, the document fabric goes so well with the chrome. It also looks very comfortable. I agree on the staging re Victoria & her “throne” — it was one of the first comments I made to a friend about the show. The synergy between story, character & staging/production design is some of the best I’ve seen on TV in a while. It really is like her throne! Your chair looks great–thanks for sharing the link, Richard! That’s great to know about Home Goods – I’m headed off there! Great Job Julia, That does look like the Grayson house there in Amaganssett. Awsome. !! Has anyone seen the beautiful interiors on American Horror Story? Wondering if it’s an actual home or a set?? I noticed her headboard before the chair (they’re very similar fabric if not the same) and recognized it from being from pier one and THEN I saw the chair. 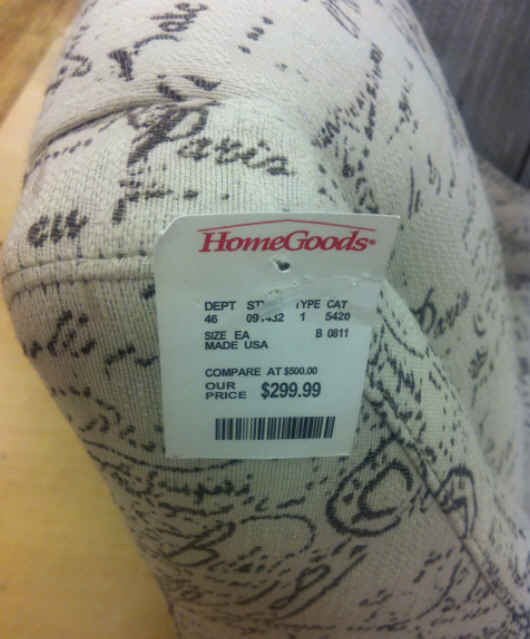 I can’t find a picture to compare the two online and pier one doesn’t let you get a close up of the fabric. However, I thought I’d share the link. From far away the fabric doesn’t look the same, but I’ve seen it in person and it’s really cute. The address is 257 Further Lane, East Hampton, 11937 NY. No problem! I’ve tried to find a way to contact the location manager for the show, but so far I didn’t find a thing. If that website Seeing Stars starts being interested in the show, they will be able to tell us if we got it wrong. Perhaps the house isn’t even in the Hamptons, but like a lot of other stuff, it’s somewhere in North Carolina. Thank you and your readers who tracked it down! Can’t believe you tracked down interior photos for us. Just added the link to the post. Thanks, Juliana! Here’s an aerial view from Bing Maps. Use the + button to zoom in and use the down arrow icon to view the house from 4 different angles. You can see that this house was used as the starting point for the photoshopped version. In the photoshopped version the turret was added, the pool was moved, the house was stretched, dormers were added and the mansion was moved so that it is a waterfront property…right on the ocean. Oh, and don’t forget to choose the Bird’s Eye view from the drop down menu in Bing Maps. The house slightly above and to the right of the orange “pin” on the map. Thanks for the links, Ken! That’s great. I love that you contacted the design department at CBS to track those chairs down! love the way she uses the chair like a throne, to hold court. Thanks for correcting that, Patrick! I think the graphics department at Revenge did a better job. It’d be nice if someone from the show said something about ‘creating’ the Grayson Manor. Star News Online has cited your posts on the house. Apparently, for security reasons the ABC doesn’t want to say where the homes actually are. I love the pillows on the Grayson’s sofas (brown floral) – where can I find those? Hmmm….I’m afraid I don’t know anything about the pillows. Does anyone else? Actually, the flowered pillows look like you could use a toile type print, get a pillow form or recover some pillows. Keep looking at fabric stores for a similar fabric or look on site such as Calico Corners. I did find the chair fabric at CC but you have to go into a store to purchase it. Hope to get there soon. Also…found a long pillow with Victoria’s chair fabric at Home Goods. If anyone finds anything, please share the info. I will do the same. I found a chair at Marshall’s today that has the same fabric. Took a picture but do not know how to attache it. The cost was $199.00 It was an arm chair with wood arms. Also, they had two lamps like the ones in Charlottes room for 29.99 each. We have done this chair for a couple of people since the show aired. We offer reupholstery or we can fabricate “New” Victorian Chair. You can use Google Maps (satellite) to find the house ““located on the corner of Further Lane and Cross Highway in Amagansett”. To find it, type this number where the direction should go: 40.963608, -72.160649. It is a little north-east of the intersection in East Hampton at 253 Further Ln., East Hampton, NY 11937. Southern Furniture Company has the exact chair with the fabric. Look at their website. You will have to order it through a supplier, like our store Armoires & Accents in San Antonio. Southernfurniture.net to see the chair! Does anyone have a floor plan for this house? I’d love to “build” it in Sims. I just love it! I am very impressed at the amount of work and research that this website gets! Keep up the great job, for all of us – house obsessed people out there. My question is…. Does any own has any idea what porcelain and china is being used in Grayson´s manner? There a couple of tea sets I have noticed, one with very strong blue tower prints on it, and then there was one with what seemed like violets… Any hints would be appreciated!!! I want to buy a bedspread like in Emily’s bedrooom. Does anyone know where to get it? Thanks! I saw one at Marshall’s in my area but it was 499 but looked more like the one on the show. High back. I’ll try to get a picture. Yes Esme thats the one I saw, It was exactly like the one on the show. We’ve been calling all over the place, no luck yet. Yes, also at Marshall’s here in West Allis Wisconsin, Thats where I saw it. I should of styed sitting in it and called my husband from my cell phone, instead of walking away. My husband surprised me this past weekend with that chair! It is exactly like Victoria’s – from HomeGoods! I am in love with it! Trying to find that chair!! Stupid me I did find the exact one at Home Goods in West Allis Wisconsin, and I walked away to find my Husband, and another woman took it while I was away. Does anyone know where I can find another chair like Victorias, with the High Back? I am so mad at myself, I even told that woman that I wass going to buy it, that I was just looking fo my Husband. Oh well, you snooze you loose!!! The chair I saw was $499.00 High back thick cushion. Alot different than the $299.00 posted here. I’m so mad at myself for walking away. If anyone knows where I can find one, pleas e-mail me!! Hi…I am kind of late on the chair, but does anyone know where I could find one right now for a reasonable price? I bought a very similar chair with the same fabric about a month ago and then realized last week that it was Victoria’s chair!! I love it and it is so comfy! I got it from American Factory Direct in Baton Rouge, LA. They also make it in a turquoise color, in many different styles. I just bought a very similar chair at home goods in Minnesota. Just like the one in Kathy’s picture, except tan with white writing. The chair was made by a furniture business called Sorrento Furniture. omg thanks so much! i havent been able to find it anywhere. Does anyone know where Charlotte’s bed is from or can order something similar? The chair is definitely from Ballard, as are a lot of other things in that house. I noticed, however, that there are even more items from Ballard in Emily’s beach house. Almost the entire house is furnished from Ballard Designs! The sofas, rugs, accent chairs, and tables. I think for the Grayson Manor they mixed Ballard in with more high end choices. Love your website! I have about 12-15 yards of this fabric that I bought. Half is cut for curtains that is unsewn and the other half is sewn into curtains already. I would love to get rid of it should anybody want to buy it — email carminbryan@yahoo.com. The fabric is just sitting in my closet going to waste! Just saw the chair the other day at Dillard’s on sale for under $200!! And it was the dramatic shape like Victoria’s! Anyone know where I can find that tea cup Victoria is always drinking out of? Its blue and white. anyone?! I really love Charlotte’s girly but sophisticated bedroom. Can we get some pictures of that? In the most recent episode Emily is in there talking with Charlotte about some things and we get a pretty good view of the room. I love the color scheme, her bed frame and some of the sheets and other furnishings. Any ideas?? Haha, in the season 2 finale they used a shot from the real house without any CGI or Photoshop effects! Love that you caught that–thanks, Kevin! The chair and most of all the furnishings for Revenge were designed and purchased at Morris Sokol in downtown Charleston, SC.